The Public Works Department will continue the citywide leaf pick up into January 2019. They are starting in the SW corner of the City, then to the NW, NE and SE and will probably make 2 to 3 rounds. Rake leaves into open areas along the curb, avoiding mailboxes, fire hydrants, signs, parked cars, and other obstacles that would prevent the leaf collection truck from getting to your leaves. Do not rake leaves into the street or storm sewers; leaves clogging the storm sewers can cause flooding during heavy rains. 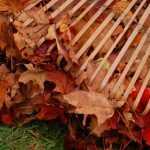 Do not rake twigs, branches, sticks, rocks, bottles, garden debris, pumpkins, etc., in with the leaves; these items can clog up the machine and cause considerable delay to the leaf collection. Avoid parking near leaf piles. Piles blocked by vehicles will not be picked up as it is difficult for the truck and leaf machine to maneuver around parked cars. Rake leaves as close to the curb as possible and cover them with some type of tarp.